Sudden storms won't have you suddenly soaked with the Showers Pass Storm Pant. Fully seam taped waterproof construction. Elastic waist is easy to put on over pants and holds snugly. Zippered back pocket holds small items that need to be kept accessible. Angled cinch straps keep pant legs away from the drivetrain. Reflective trim for visibility. Includes mesh stuff sack for easy packing. If you are looking for carry some light and affordable rain pants in case of an down pour on your commute to work or home, then these are them. Could you use these on a long tour? Yes, but there are better products out there, which breathe, and would be worth paying more for. Waterproof but definitely not breathable. I intended to use this whenever Im riding in extreme rainy weather. It is built to fit over cycling pants, but the sizing is questionable, Im not able to cinch the pant legs to avoid the spokes, etc. 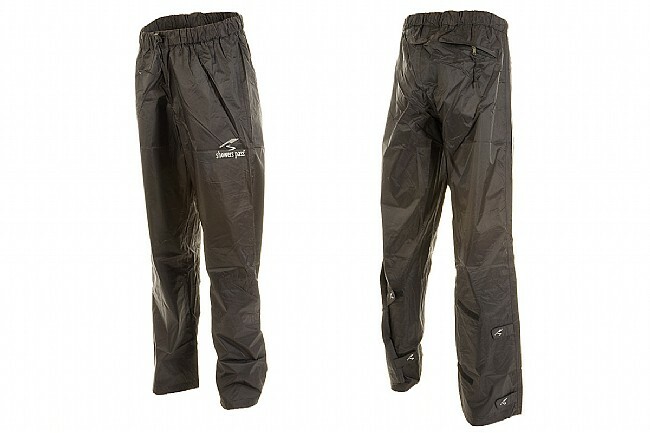 Recently, I purchased a pair of showers pass storm rain pants. I had originally ordered them online. I didn't really know what size I wore, so I guessed. As luck would have it, I guessed wrong! One day while out running errands I decided to stop by the shop to exchange the pants. Sadly, they were at out my size but said they would have them shipped to me asap! After a couple clicks on the computer, boom, done. Within two days my rain pants were shipped to me right before the rains came! I love these pants....keep me very dry and warm. I would recommend not only the storm pants but Western Bike Works. I searched all over the internet and they had the best price ANYWHERE! 5 stars! Good quality, packable, runs small. Packs down in it's bag, seems good quality, but runs a little small. Might want to get next size up. Haven't used on a long trip yet. I use these pants in the rain, sleet, and snow commuting to work every day and have yet to be disappointed. Great design works just fine. Used on a five day trip in the mountains with lots of rain but no downpours. Really nice design and great rain protection. No issues. Use on daily commute. They keep me dry and are easy to put on and take off over pants. True yo size fit w no zippers to snag and tear. These pants are indeed water proof, and breathe proof. These are hot pants! I was sweating just getting my bike ready to roll. Too hot even for a 40 degree rainy day. Great fit & comfort without being baggy! 7 of 22 customers found this review helpful. I 've worn these pants for a full 300k ride (190 miles) 34 inch of rain and 10,000 feet of climbing. Everything was wet and cold but the SP Storm Pants kept me reasonably drier and more comfortable. The pants have good velcro placement for a good fit that does not cause extra wind resistance when riding my bike. These pants are my favorite shield when it is cold or wet outside. They are compact and lightweight enough to stuff in back jersey pocket. Not really meant to fit over regular clothes without ordering a size up. Best pants I've tried yet. Even though they got a tough review from another rider, I bought these. I found them to be a useful product. Yes, there is a little sweat inside but it is not anything like how wet I'd be if I wasn't wearing them. I am also from Portland, and let me tell you, you just can't go without some type of rain gear here. There isn't any kind that won't let you sweat some, so you might be happy with these. I like the Velcro on the outside that you use to fold and keep the pants leg out of the way of the chain. The only strike against these in my book is that I have to take off my work boots to get them on. They go right over cycling shoes, though.